The week has flown by. We are now three sets of couples. Cécile and I , Monty and Dolly and Lorenzo and Gabrielle. At first Monty was a little frosty with Lorenzo but they now appear to be getting on. One day we visit Lorenzo’s family villa which is delightful and other days we play tennis, take delightful walks around the Crossiette, the Casino gardens and the town and harbour, watch horse racing, polo and dance each night. We even spot Winston Churchill being chased by photographers as he tried to play golf. Jean Gabriel Domergue has transformed the Ambassadeurs Restaurant into a courtyard of an old inn in Seville, decorated with whitewashed and pink walls under a blue sky for the Gala Seville sprinkled liberally everywhere with flowers. He implored all the diners in a neat little invitation booklet to wear appropriate dress for each gala occasion but let’s face it who could ever get self-conscious British aristocrats to wear anything but ultramodern raiment? However, some dress up in Spanish colours of yellow, red and gold, including Dolly and Cécile. For the entertainment, musicians who looked as if they had just come back from a bull fight, play popular Spanish songs of the 18th century as a background for the Spanish artist Argentinita whose castanets gave point and rhythm to her excellent dances. “She is known as the Flamenco Pavlova and the Queen of Castanets” says Monty. The next gala at the Casino is the Enchanted Garden fete and the Ambassadeurs has become a garden festooned in flowers and fruits of every hue. The roof is covered with interwoven leaves and branches and huge dragonflies of all colours are suspended from the ceiling. The walls have been transformed with panels of climbing white roses and pergolas of red jasmine. Argentina provides a wonderful new set of dances and the cabaret is augmented by an hilarious interlude when members of Billy Arnold’s orchestra appear dressed in rather airy costumes and perform a dance of the wood nymphs. This is followed by Chris Lee dressed as a Spanish dancer doing a burlesque of Argentina.. I danced the night away, predominately with Cecile, who like all the girls had been propelled into a world of gushiness by the enchanted garden and was becoming rather lovey-dovey. I spend the day with Papa exploring land and properties for sale first in Cap Ferrat and then Cap d’Antibes. The latter looks more promising because it is nearer Cannes which we all prefer. It is a good job we are not superstitious and thank God it is not a Friday. Just south of the sleepy little port of Antibes amongst the pine clad slopes of the peninsula, we find and buy a rather magnificent, large plot of land with a run-down villa and its own bit of coastline. There was a sense of remote tranquillity at this spot that will be a welcome relief to the usual hustle and bustle of city life and yet even here, Cannes and Nice are very accessible. We are not far from the Hotel du Cap at Eden Roc where we take afternoon tea to finalise the deal. Although it will take a while to finalise everything we see a variety of people over the next few days to plan the renovation work. We have a family day out to show everyone the villa and there is much excitement and discussion about décor, furnishing and the garden as we have a picnic on the Plage de la Garoupe. Aunt Mimi has bought Sir Oliver. I am having a quiet lunch in the Carlton with Cecile, Monty and Dolly when suddenly I hear familiar voices and in come the Dolly Sisters accompanied by a very tall and handsome young man. When Dolly waves they come over to our table and introduce us to their brother Edward, or as they call him Eddie. The gala at the Ambassadeurs has a winter theme as “The Kingdom of the Queen of Winter’. The huge chandeliers were half covered in cotton wool cut out in shapes of large holly leaves. There was a giant snowman in one corner and little leafless trees covered in crystallised imitation snow dotted around the room. The lights were turned down for the entry of the Dolly Sisters who appeared in white tulle frocks. At the same time waiters handed out paper bags filled with imitation snowballs and everyone pelted each other while the Dollies skipped daintily out. They returned dressed as jet black ponies with high head-plumes and other jingling equine paraphernalia driven by their brother Eddie with a cracking whip and hard bowler hat as he directed them at a gallop round and round till the entry of a reindeer, more snowballs and a walking snowman drew their prancing pony trot to a close. The evening was a huge hit. The Dollies are unique and amazing and their dancing so different from anything ever seen before. We dance all night and the rather dashing Eddie monopolises Dolly who looks as if she is being swept off her feet. I of course have several dances with each of the Dolly Sisters. The Dolly Sisters have been such a success at the Ambassadeurs that dancing managers along the coast are offering large sums of money to lure them away. The gala evening tonight has the theme of ‘The Venice of Casanova.’ The Dolly Sisters dressed identically in Venetian gowns are once again escorted by their brother Eddie and give another unbelievable performance. I am still quite alarmed when I overhear embarrassing comments at a nearby table. “We are not” he says gruffly. I dance again with Jenny and Rosie and they both tell me that they have accepted a very lucrative offer to dance at the new Casino in Juan-les-Pins. Apparently Édouard Baudoin a restauranteur from Nice purchased a dilapidated and almost bankrupt casino there and rebuilt it believing that this area, mid-way between Cannes and Nice, had great potential. The Dollies were going to star in his opening-night gala to be held in early March in an attempt to put his casino and Juan-les-Pins on the map. I am really amused given that we have just purchased a villa nearby. I think we might have chosen wisely. Monty and Dolly have already left for Paris. All too soon our soujourn on the Riviera also comes to an end and are forced to leave and return home. I have an emotional farewell with Lorenzo, who promises to visit London and Paris soon. I woke up (far too early I hasten to add) to the sound of the surf and the smell of a brisk salt breeze perfumed with flowers in full bloom coming from my open window. I get ready, have a spot of breakfast alone and run to the beach. It is not a good day for sunbathing or swimming. There is nip in the air and it is clouding over. I am told that the weather has been variable. The beach is sparsely populated and I wander around debating the pros and cons of getting wet. I stumble upon a photographer taking pictures of two amazingly adorable ladies. They look identical. They are short, slim, dark haired, exotic looking and amazingly beautiful. They are wearing matching black bathing suits. Whoever they are, they are noisy and seemingly having great fun as the photographer and his assistant fiddle with his equipment. “Pleased to meet you Fynes” says one. “Oh” says another. They look at each other and giggle and then point at each other. ‘Oh we will be there too!’ they exclaim in unison. “Bye bye and see you later mon cheri” says Jenny blowing me a kiss. They giggle as I wave and wander off blushing like mad. What a story to tell. I notice that more people had emerged on the beach as glimpses of sun flash through the cloud. I reach Mama and Papa and some guests lounging under a row of little striped umbrellas all wearing some rather splendid bathing outfits. ‘Fynes, mon cheri’ shouts Aunt Mimi ‘We decided to come here rather than Le Potiniére today. Come and play Mah Jong with us.’ I settle down and idle away an hour listening once again to further endless chatter. Almost at once everyone stopped talking and gawped as a young man walked past wearing a black cloak of shiny satin with a wallpaper design of large pink roses. He marched along with two large Alsatian wolf hounds and riding on the back of one was a small brown monkey who was having great fun picking up peoples slippers and other things and throwing them around! “Oh my word…… Deauville becomes more eccentric about its pets every day” said Mimi with a shrug and adds ‘Often the most eccentric people are the best you know” and winks. Mama is on the terrace at the Normandy for lunch with three new prospective brides and their mothers. I admire Mama’s tenacity. This time the candidates are all French. Taking Aunt Mimi’s advice, which I am sure was intentional, I gravitate to Cecile d’Orsay and her mother who are from the famous French perfume company. Cecile is the complete opposite to Eva – dark haired and clever. She is also a hoot and not in the slightest bit stuffy, unlike the other two. I suspect Mimi was giving me a coded message earlier. As usual, after a pleasant nap, cocktails were taken in our suite before a large party of us swept off to Ciro’s for dinner. Cecile and her mother were there and joined us. Later, I took Cecile onto the dance floor. She was wearing a simple black satin form-fitting gown, devoid of decoration but framed by an array of glittering diamond rings, earings, bracelets and necklace. She smelt divine of course. ‘Tu es magnifique!’ she whispered in my ear. I am over the moon. ‘Toi aussi, ma cherie’ I reply. Ciro’s have a cabaret of sorts and I was stunned by the dancing of Samya and Sawyer. They gave several usual yet original variations and then performed an extraordinary number called Une Danse Macabaretre. She a beautiful vision in a silver frock as she dances and gazes at her own beauty in a silver mirror. Behind her stalks la Mort, (Sawyer) in skin tight clothes and a skull cap as a terrifying apparition. Their dancing gets wilder, she becomes breathless with fear, she falls to the floor and death clutches her throat and claims her. Everyone stands and applauds voraciously. ‘They have been a hit in London and the Riviera’ says Papa ‘she is exquisite but also quite the business woman. She demanded a huge fee for dancing exclusively for the Ciro chain for one year and got it.’ To my surprise Papa heads straight for Samya who is now sitting at a table with friends. Hmmm, they appear to know each other rather well…. Monty arrives in the morning. I meet him in the foyer of the hotel after he has checked in. ‘Dear boy’ he exclaims ‘…you look marvellous: this place must be agreeing with you!’ I give him a run down of the most recent developments. We continue to talk about Deauville, London and Paris and who we know and we don’t know, before heading off to La Potinaire and then lunch. Miss Tree changes for each and wears even more wonderful outfits, all of which she designed herself. Despite being introduced Mama is not happy ‘Who is this woman’ she whispers in my ear at lunch. ‘She is very famous Mama as a dress designer and she is a friend of Monty’s’ I reply rather sternly. Thereafter, my chat took refuge in generalities until the cabaret. The Dolly Sisters were simply sensational. Their first dance was an old fashioned waltz with dresses of grey velvet, silver lace and fringe lined in turquoise blue with huge grey hats trimmed with osprey. The second dance was a mad kind of Apache dance but with elegant bride-like white chiffon frocks abundantly showered with brilliants and exotic white plumed head dresses. Their last number was a gipsy dance in deep orange chiffon with silver bodices, hung with bunches of cherries and matching hats. The applause was deafening. 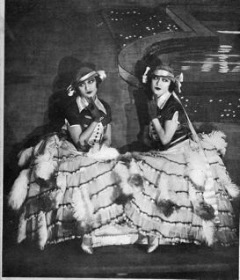 The compére thanked the Dollies and then said ‘I must extend a special word of thanks to Miss Dolly Tree who designed all of the Dolly Sisters costumes and to our great delight she is with us tonight sitting with the Harte –Harringtons.’ There was a hearty round of applause and I turned to Mama who is smiling profusely. I think her reserve might have evaporated. Suddenly both sisters are at our table, wearing matching silver evening gowns and wearing a profuse number of glittering jewels. They hug and kiss Dolly Tree in turn. ‘…hello Fynes, so glad to see you!’ says Jenny. ‘Would you dance with me Fynes?’ asks Rosie. ‘Who am I going to dance with?’ asks Jenny. ‘Oh I think I can oblige’ suggests Henri immediately. My parents’ jaws have dropped. Monty is smirking. Millie nudges Henri in the ribs. Eva scowls. Mimi is smiling. Cecile is frowning, and Dolly is laughing. Today is my birthday. I am glad it falls on a Saturday. I have a lovely birthday breakfast with all the family at the Normandy. I spend the rest of the morning with Monty and Dolly at the Potinaire. We have a small private family lunch at Ciro’s. Finally, my birthday party dinner is in the Ambassadeur’s restaurant at the Casino which is a rather elaborate affair in a large private room for 60 guests. A cake is wheeled in on a trolley by the Dolly Sisters who sing happy birthday! Mama kisses me. Mimi kisses me. Millie kisses me. Eva kisses me. Cecile kisses me. The Dolly Sisters kiss me, one on each cheek. And, finally Dolly kisses me on the lips but lingers… hmm that is interesting.